McCormack Innovation (MI) was set up to address the low return rates of bowel or colorectal cancer screening programmes worldwide where most return or compliance rates around a dispappointing 50%. According to the Department of Health Statistics, bowel cancer is the second highest cause of cancer deaths in the UK, with approximately 16,000 fatalities and 40,000 new cases diagnosed each year. The American Cancer Society estimates 140,000 new cases of colon/bowel cancer and 53,000 deaths for the year 2016. With early detection nine out of ten lives can be saved but at this time. With present screening programmes, detection rates are determined by the low return rates. MI identified that the main reason for these low returns is the non-existent method of stool sample collection.To this end, MI embarked upon the development of a stool collection device. The resultant product is a totally unique device, the safety and convenience of which will immediately raise return rates and reduce hospital infections, saving lives worldwide. When used in hospitals, clinics and pharmacies (for home use), this stool collection method will greatly reduce the risk of cross contamination and resultant infections. 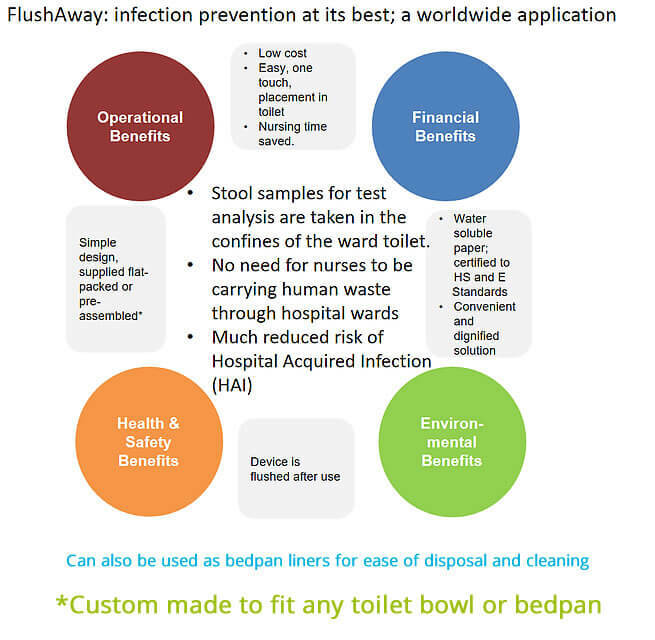 From an early stage the benefits from the use of this stool collection system in hospitals worldwide, were realised. Presently when stool samples are presented by a patient in a ward toilet, the stool has to be carried though the ward by a nurse to another room where a small sample of the stool removed is taken for lab tests. The remaining human waste has to be taken to a “dirty” room for disposal. This is of course time consuming and presents a high risk of infection and cross contamination. With our new FlushAwayTM system the nurse and the hazardous material never leave the confines of the ward toilet. The required test sample of the stool is simply taken, again in the confines of the ward toilet and the waste is safely FLUSHED AWAY! This product would of course be an obvious safety benefit to all involved when patients are in isolation/quarantine and stool sampling is so often necessary and frequent. No more need for nurses to carry human waste through hospital wards for testing, worldwide. From the outset, we knew that the unique material required had to meet certain criteria and specifications. This journey would take us to India, Canada and the USA to meet potential manufacturers and suppliers. It soon became clear that the only company to meet our specific requirements of a Laboratory tested product that had no adverse impacts on human health and the environment, was Smartsolve Industries based in Ohio, USA. This product was subject of an audit and evaluation by IP pragmatics of Fleet Street, London. The resultant report gave a substantial value to the intellectual property held by McCormack Innovation and can be viewed by selected parties,under a Non-Disclosure Agreement. Patenting of this product was carried out by Dr. Michael Spencer of Johnsons Patent and Trade Mark Attorneys of Edinburgh. Dr Spencer is to submit this device for the European Patent/Inventors Award.